AllegroMedical.com presents The Knee Bolster and Extension Set. The Knee Bolster and Extension Sets by Alimed are excellent wedge bolster pillows that are useful in stretching programs, quad exercises or even quadriplegic care. The extension securely attaches to the knee bolster for additional comfort positions. 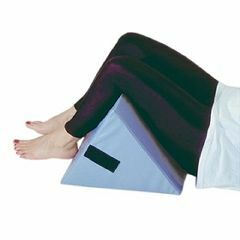 This leg support pillow supports the knees and lower legs while in a supine position. When used in quadriplegic care by a specialist, this wedge positioning pad is ideal for relieving strain and tension in key areas. For non-ambulatory patients, positioning pillows are vital part of daily care and comfort. Finding the correct shaped pillow, with the correct tension, is as important as the right mattress is for a restful sleep. Treat yourself to the comfort and care you deserve with this pillow. as a bolster under knees . as a bolster under knees . relieve pressure on spine. works great to take pressure off of discs in spine in bed or reclining.